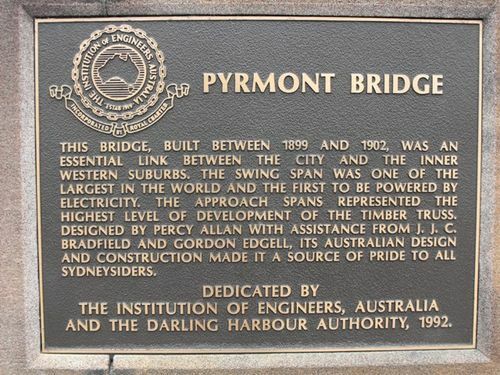 A plaque recognises Pyrmont Bridge as a National Engineering Landmark. The first Pyrmont Bridge which was opened on 17 March 1858, was a wooden pile bridge with a iron centre swing span. This bridge was demolished around the time new Pyrmont Bridge was opened in 1902. The foundation stone for the new bridge was laid on 6 December 1899 by the Hon. E. W. O'Sullivan and the bridge was opened for traffic on 28 June 1902 by the Governor of New South Wales, His Excellency Sir Harry Holdsworth Rawson KGB. The engineer was Percy Allan (1861–1930). The bridge had one of the largest swing spans in the world and it was one of the first to be powered by electricity. DEDICATED BY THE INSTITUTION OF ENGINEERS, AUSTRALIA AND THE DARLING HARBOUR AUTHORITY, 1992.